Browning during winter is normal for American arborvitae (Thuja occidentalis), but arborvitae browning at other times of year could be a sign of drought stress or disease. Also called Eastern arborvitae or white cedar, American arborvitae are tall, evergreen trees. They thrive in moist, well-draining soil and full sun or partial shade. They grow in U.S. Department of Agriculture plant hardiness zones 2 through 7. Arborvitae foliage turns brown naturally in winter, and inner branches drop. The outer foliage on arborvitae turns yellow-green or brown-green when temperatures drop in winter. At the same time, small inner branches turn brown and fall, which can make the trees look browner than normal. In spring, new green foliage grows, improving the trees' overall color. Varieties that stay green during winter include "Nigra," which is hardy in USDA zones 3 through 7, and "Techny," which is hardy in USDA zones 2 through 8. "Rheingold" is a variety that turns bronze during winter, and it grows in USDA zones 2 through 7. Dry roots can cause arborvitae problems. They don't tolerate drought, and newly transplanted trees are especially at risk if their root balls aren't soaked after transplantation. If you suspect a tree is suffering from dry roots, dig down carefully 6 to 9 inches between the roots closest to the trunk and feel the soil. Soil that's moist to the touch doesn't require watering, but if the soil feels dry, place a garden hose next to the trunk on the soil's surface and leave it to drip steadily for an hour or two. In dry weather, apply 10 gallons of water for each 1 inch of trunk diameter at knee height three times per month, watering evenly within the drip line of the tree. An average garden hose supplies 10 gallons of water every five minutes. Brown or ash-gray twiggy material that remains on arborvitae for months is a symptom of twig blight. Phomopsis twig blight (Phomopsis juniperovora), kabatina twig blight (Kabatina thujae) and pestalotiopsis tip blight (Pestalotiopsis funerea) are fungal diseases that infect arborvitae. Kabatina affects 1-year-old American arborvitae, and phomopsis twig blight and pestalotiopsis tip blight affect trees of any age. A common sign of twig blight infection is small, black spots appearing where living wood meets dead tissue. Sterilize pruning shears by wiping the blades with a cloth soaked in rubbing alcohol, and prune arborvitae suffering from twig blight. Prune branches and twigs 3 inches from the beginning of the dead tissue, and put all the trimmings in the trash. Signs of leafminer infestations in arborvitae include yellow or brown leaf tips that appear in late winter and early spring. In early and midsummer, leafminer moths lay eggs between arborvitae leaf scales, and after the larvae hatch, they burrow inside the foliage to feed. By the following spring, the leaves and twigs are hollowed out and break off easily. Prune infested tips with sterilized pruning shears to control light infestations or spray heavily infested trees with a carbaryl pesticide. Put on a long-sleeved shirt, long pants, gloves and safety goggles, and dilute a 22.5 percent carbaryl product at a rate of 1 1/2 fluid ounces per 1 gallon of water in a garden sprayer. Spray arborvitae in fall or early spring, covering all foliage, or apply the product according to the manufacturer's instructions. 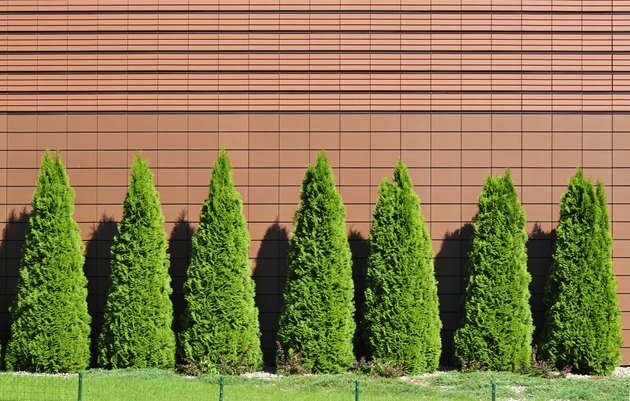 Arborvitae can survive losing of up to 80 percent of their foliage to leafminers.